Several hotels near Jacksonville Port give your family the opportunity to enjoy both worlds: have fun aboard an all inclusive Caribbean cruise and enjoy the attractions of Jacksonville before or after your family Caribbean cruise ship vacation. This location puts the cruise terminal a short distance from the airport, not far from the heart of Jacksonville and close to many top attractions in the city. Adventure Landing Jacksonville Beach - Great Family Fun at many locations. Budweiser Brewery Tours & Gift Shop - Take the Tour! Museum of Science & History (MOSH) - Great Shows included with tickets! St. Augustine - America's charmingly "Ancient" City - is not far away. Now that you have several great reasons (and many others to cruise to the Caribbean from Jacksonville), let me show you some recommended and affordable hotels near Jacksonville Port. Here are 3 of several top hotels near Jacksonville Port. 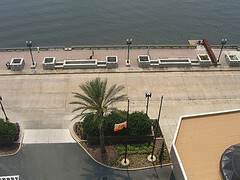 Address of Hotel: 14565 Duval Road, Jacksonville, FL 32218, U.S. Distance from Jacksonville Cruise Terminal: 6.6 miles. 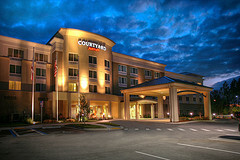 Address of Hotel: 14668 Duval Road, Jacksonville, FL 32218, U.S. Address of Hotel: 14670 Duval Road, Jacksonville, FL 32229, U.S. 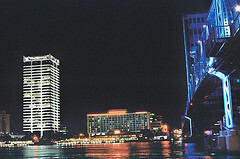 I have only listed 3 of many Jacksonville Port hotels from which you can choose. If you have not found the one that you are searching for, look below for more options. If you are still searching for a place to stay that is near to the Jacksonville Cruise Terminal and the major attractions of the city, follow any link below to learn more about other recommended hotels near the Jacksonville Cruise Terminal. If you still have not found a hotel that you like, use the TripAdvisor Search Box below to complete your query. The nearest airport to JAXPORT is the the Jacksonville International Airport (JAX). Most of the major airlines fly into JAX, so your family should be able to find a suitable flight into Jacksonville. The airport (JAX) is located just about 9 miles from the Jacksonville Port (JAXPORT), so getting to the cruise terminal should be a breeze. The easiest and fastest way to get to the port is by taxi. Gator City Taxi is the official taxi company serving Jacksonville International Airport. Service is available at the entrance to JIA, or you may call Gator City Taxi at (904) 741-0008 or (904) 355-8294. It is our hope that you have found what you came looking for. Jacksonville is a great city to visit and an ideal cruise port for residents in Georgia, Northern Florida, South Carolina and elsewhere. Additionally, with an international airport, just about anyone can choose to launch their Caribbean cruise ship vacation from Jacksonville. I trust that the information presented here will help you with your search for comfortable and affordable hotels near Jacksonville Port.